Discussions are a great way for workspace members to communicate and maintain a record of their conversations. Discussions can be started and continued either online or via email. Either method will create a record in the workspace for reference in the future. Discussions are unique since they are the only application in iMeet® Central that syndicates your comments sent in by email — allowing you to have a discussion without needing to log into iMeet Central. Discussions can be created via email or within the workspace. 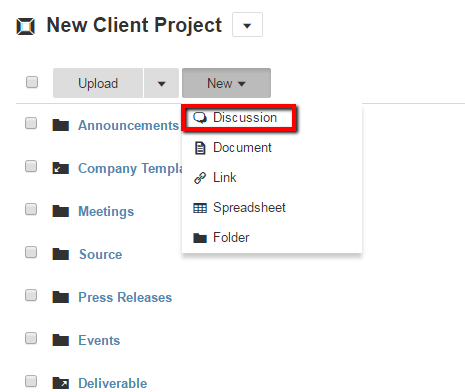 To create a new discussion within a workspace, navigate to the Files & Discussions tab and select New > Discussion. 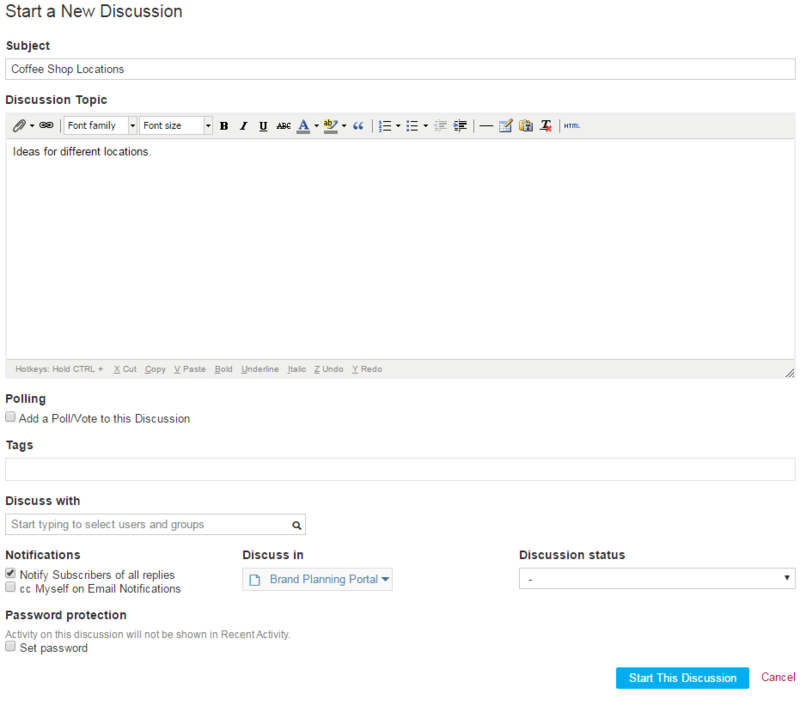 When starting a new discussion, you have the options to input the discussion subject, topic, poll and tags. In addition, you can also choose who to have the discussion with, which folder the discussion resides in, the discussion status and an optional password. Once you have filled in the information and are ready to start your discussion, click Start This Discussion located on the bottom. Members can make changes to the original discussion post by clicking on the Options menu and then selecting Edit Discussion. Members can also move discussions to other folders or workspaces by selecting Move Discussion. To delete a discussion, simply select Trash. Once a discussion has been sent to the Trash, it can either be permanently deleted or restored. 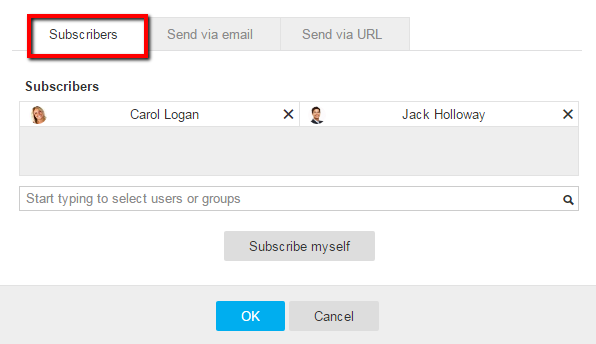 Workspace members can be subscribed to discussions, which allows them to receive email notifications when any changes or comments are made to the discussion. When creating a new discussion, subscribers can be added by typing a member or group name in the section titled "Discuss with." In addition, you can also click on the magnifying glass icon to browse and filter all workspace members and groups. You may also choose to "Notify Subscribers of all replies" so that they receive an email notification for each comment. After the discussion has been started, members can be added or removed from the Subscribers list by clicking on the Share button. 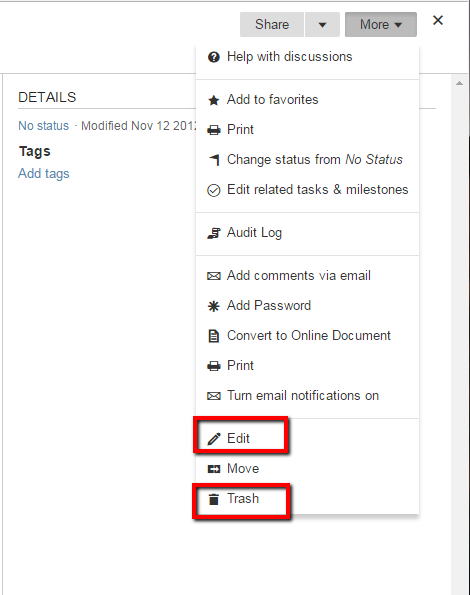 Members with List Admin or Workspace Admin permissions can turn email notifications for discussions on or off. To do so, simply click Turn Email Notifications On/Off. Depending upon the current setting, this will either turn email notifications on or off. Note: The default setting is for email notifications to be turned on. 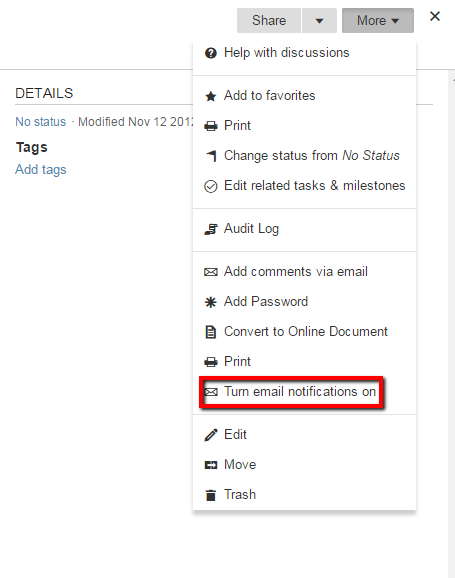 Workspace Admins also have the option to automatically turn email notifications on or off for all new discussions. This setting is located in the Workspace Configuration Options and is set to default to on. Discussions can be password protected. 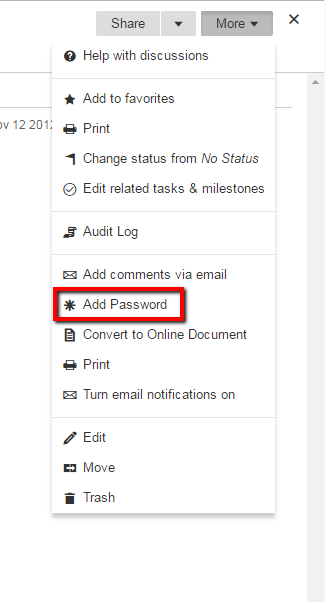 To set a password for an existing discussion, navigate to the discussion and click Password Protect Discussion. Once a password has been set, members must enter the password in order to view the discussion's contents. When a password has been created, you can change or remove the password by selecting Change Password or Remove Password located under the Options drop-down menu.